I have been way too serious in my last few blogs, mostly in response to private messages and emails I have been receiving. I appreciate the questions and am always happy to share my views, as long as everyone understands they are only that. Now, it is time to have fun - at my expense. After all, this is my blog and it is all about me (sort of). I started skating at a very young age. I actually don't clearly remember when my mother strapped double runners on my feet and my father insisted I wear a hat since I was relatively hair challenged as a young child. I do know that it was outside on a frozen pond near our vacation home in Westport, Connecticut. 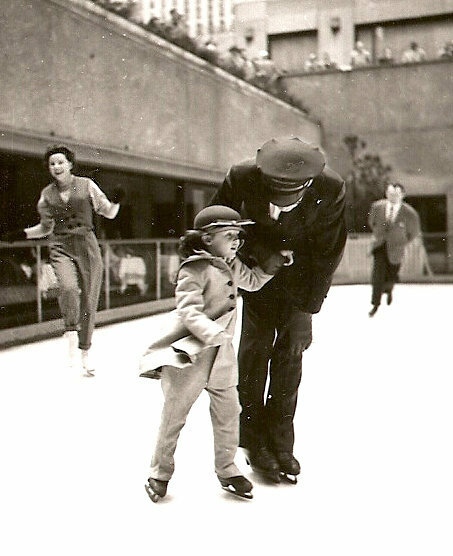 My first clear recollections of skating actually start about the age of four when both my parents were working at NBC in New York. In those days, Howdy Doody was my babysitter (if you're too young to know who that is, Google it!) and my outdoor recreation was learning to skate at Rockefeller Plaza. I skated a lot back then, mostly to keep me from running a muck in 30 Rock. I was all decked out in a hat (with decidedly more hair at that point) and a Chesterfield coat with matching leggings. I had rental skates and a nice man who dragged me around in circles while I watched the people dining behind the large windows overlooking the rink. I loved that time when everyone was watching me and I thought I was just the best little skater out there. Children do have fertile imaginations; I was no exception. I continued skating when my mom remarried and we moved to Chicago. There were parties at a very fancy and exclusive Near North club where curling was the top winter sport. 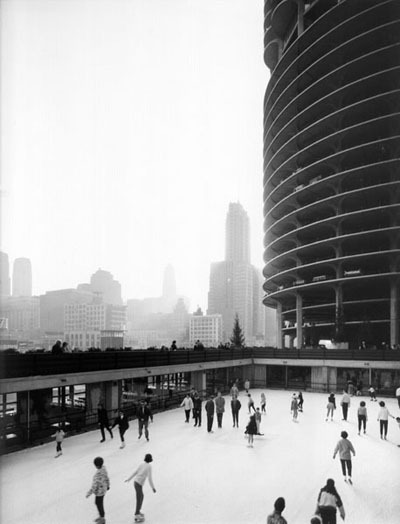 There was outdoor skating at Armory Park near Lake Michigan where the city froze the equivalent of three football fields, surrounded them with warming huts that looked like ice fishing cabins and then pumped absolutely dreadful organ music through equally dreadful and inadequate speakers. Once a week, there was this kid named Richie skating with all of us. He was always accompanied by big men with no necks. It wasn't until years later that I figured out who that was. I took figures and freeskate lessons at the venerable old Rainbo Arena, which is long gone though the famous skate shop namesake remains. 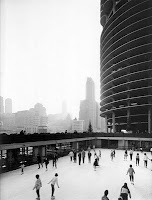 In high school, I was a skating guard - complete with uniform jacket - at Marina City's tiny but out-of-the-wind Rockefeller Plaza wannabe rink. I took my passion for the ice to college in Denver, but eventually skiing won out as my sport of choice. After moving to the mountains and becoming a mom - then a skate mom - I served time as club president, a Christmas elf, a Victorian ice dancer, a tree, a Boogie Woogie Bugle Girl, an ice monitor, basic skills assistant, bronze level ice dancer and one of those people who took stitches in my chin from catching a toe pick, much to the amusement of some of the older kids. When we moved to Colorado Springs, my skating days were pretty much behind me. 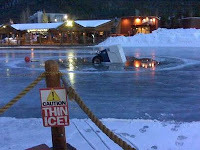 While it was acceptable to skate with our club in the mountains, to do so at a training facility - even on public session - was more than embarrassing. Occasionally, I would seek refuge back on the frozen ponds of the mountain resorts, alone in my love of skating and far away from the prying eyes of other parents and the critical, wagging tongues of higher level skaters and coaches. 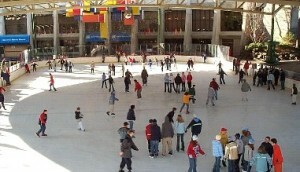 The first time we went, I walked by the wonderful outdoor ice rink and longed to don boots and blades. I love outdoor skating more than anything and this was the perfect venue. I never got around to skating that year; I always regretted it because I didn't think we'd ever be back in that wonderful city. Of course I was excited. It was Olympic year. Everything our skater had worked for was on the line. I was so excited to go. I was so excited to skate. I called some friends and off we went. Our skater's coach from Aspen, his sister and friends from across the country. It was a wonderful few hours of fun and anonymity. Like Spokane, it was perfect. It was my moment...for a moment...and that was enough. For years, the place where I work was considered the home of figure skating. While the arena was torn down in 1994 and replaced with a new training facility about three miles away, my dream was to some day skate there. Last week, I finally got my wish - sort of. A coach whose famous last name is synonymous with a legacy of ice shows, organized some young skaters to perform for a convention group. No, he didn't get tank ice; he didn't actually get ice. What was installed was synthetic sheets of something that looked like packing material. I was intrigued. 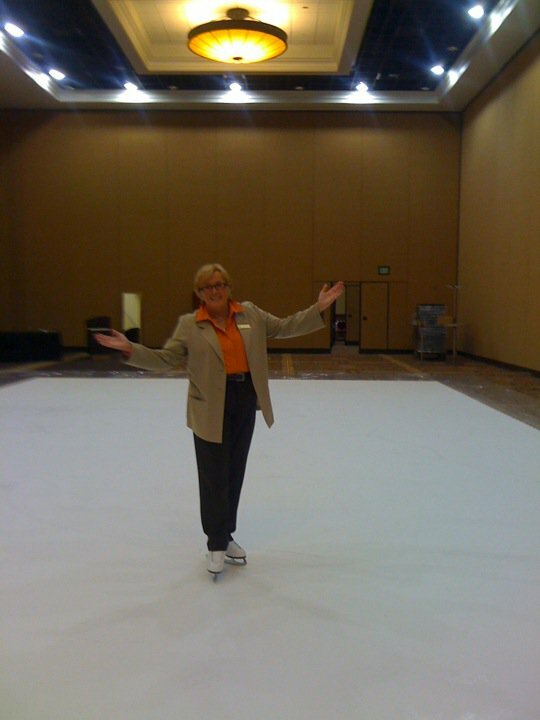 In the middle of our convention facility, laid out like Leggos, was a faux rink. Measuring 30' x 40' , this surface appeared to be something appropriate for Ken and Barbie. I watched several young athletes work their way around the rectangle, making it look so easy. Double Axel, camel spin, pairs lifts, Ina Bauer, catch-foot spin. I was in awe. After everyone left, except for two colleagues who I trusted not to laugh, I sat in my business clothes, laced up my skates and ventured forth to the "Great Unknown." It was my turn to say I had skated at this iconic facility whose glory days of ice were long gone. This was my moment to relive those days in New York, Chicago, Denver and in the mountains. I was on home turf and I was ready. If you are of a certain age, you remember a movie called The Graduate, starring Dustin Hoffman, where his character receives advice from a family friend, Mr. McGuire: "There's a great future in plastics. Think about it. Will you think about it?" I thought about it. Enough said. Donix - I like the ease of editing (of which I do lots) and the simplicity of design. Many of my friends who use this platform are more design-minded than I am. I like words; I like picture. I use Wordpress for work, and for distributing press information. I would look at some of the other people who use it much more creatively than I do, but thank you for stopping by and giving it a look. Molly, always ask that question of myself daily and wonder..
Do you mean, Richie, as in "Daly"? "When we moved to Colorado Springs, my skating days were pretty much behind me. While it was acceptable to skate with our club in the mountains, to do so at a training facility - even on public session - was more than embarrassing. Occasionally, I would seek refuge back on the frozen ponds of the mountain resorts, alone in my love of skating and far away from the prying eyes of other parents and the critical, wagging tongues of higher level skaters and coaches." There is a wonderful, social, supportive, thriving adult competitive community out there across the nation, in USFS Adult Skating (as well as the Social Ice Dance Weekends around). 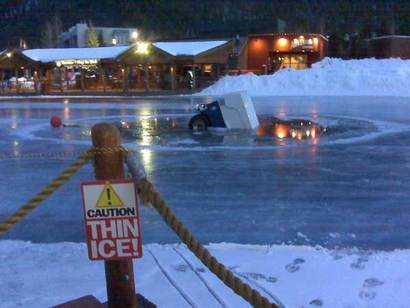 I believe you used to be at least a bronze level ice dancer correct? You could swing by an Adult Sectionals or Nationals some time to enter solo ice dance, interpretive (showcase numbers) or even freeskate if you so wished. While we take our sport and training pretty seriously, I think you'll find a refreshingly fun, social, and supportive side to the sport that would NEVER accept your skating as embarrassing.